With the Codex apparently making these guys valuable, more and more are finding their way into Blood Angel lists. Trouble is, you don't want all of them looking the same. Here's my attempt at making three different versions. The Apothecary above from GW is not a bad model actually. If you only need one in your army. In this case though, I have a Client who needs three of them and he doesn't want all of them looking exactly the same. Can't say that I blame him either. I wouldn't want three of the same thing running around either. I guess these guys are that good in a Blood Angels list that having three of them makes the difference. So it's my job to come up with three variations of this guy. And... keep it simple and cost effective. So we decided to use one "stock" model and convert the other two. Oh, and one of them will have a magnetized jump pack for good measure. 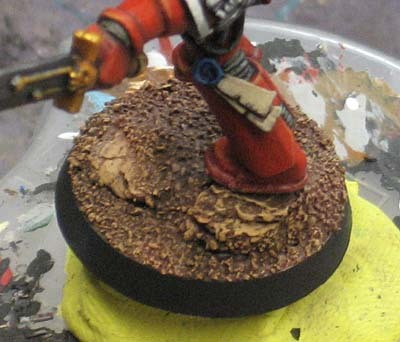 The basing will be a Baal planet dust type theme in warm colors to compliment the reds on the models. You can see in the pic above the idea is to create a little bit of variety to an otherwise barren landscape by adding some small pieces of bark to the bases and then building up around them with greenstuff in a way that sand might be blown against the smaller rocks. And here's the finished base. Looking at it now, I realize the picture doesn't show just how "red" the sand is. Here it looks more brown. It's a version of my new basing method but I only used the fine sand on the tops of these. I didn't want any variation in the sand itself, but wanted it's overall shape and the few rocks on the base to be the variety. And for those wondering, the white stuff you see on the unfinished bases is paper that has been glued down to cover up the slot in the middle of the base before putting the greenstuff down. These guys will give me a chance to really push my red painting skills too. I've got a good formula for painting red and I'm dying to give it a go on some more Blood Angles. I enjoyed painting the few Space Hulk sets that I've done before so much that red quickly went from a hated color to one of my favorites to paint. I've got one completely done at this point. I have the second one built and the third one is still waiting on one last bit to arrive. With all three of them done now, here they are. I really like the colors on that base. I never quite managed to capture the "baal" feeling on mine, any recipe to share ? Mordian 7th: Thanks. I try and share all the little things since everyone does it different. Anon: I'll make sure I add it to the post with the final pics. I'm not sure if I captureed it (since I don't play Blood Angles), but it seems to give enough of the effect that people pick up on it right away. Looks great...at this point, your basing is damn excellent and really...I'm not surprised by the quality anymore. I like the blue purity seal instead of green. I think I'm going to steal that one....the blue looks better! Not to echo Mordian7, but might want to clean up the "Angles" to Angels through out the post...though I'll admit I chuckled when I saw it. "The Emperor's Blood Angles! Look out for their obtuse blades! Gah!!!" Cawshis Clay: Oou can proof read it a hundred times and still miss the stuff right in front of your nose. So much for professionalism, I can't even spell the Chapter names right. 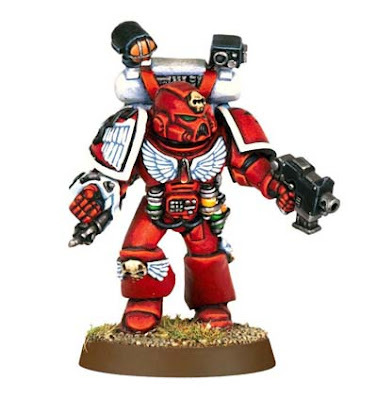 I don't get why all purity seals has to be red, and I being a Blood Angels collector (haven't gotten so far as to be painting yet), have often wondered that I would use different colours for my seals, mainly because red against red just doesn't make the seal stand that much out, so I found this, taken from Wikipedia- "By 1866 many colours were available: gold (using mica), blue (using smalt or verditer), black (using lamp black), white (using lead white), yellow (using the mercuric mineral turpeth, also known as Schuetteite), green (using verdigris) and so on. Some users such as the British Crown assigned different colours to different types of documents. Today a range of synthetic colours is available." I really like the way you've captured the feel of the Blood Angels homeworld with the basing, well done. Great post and thanks to Anonymous for the info on the seals. I had this very same question regarding red on red myself and never took it any further. Are command squads or the metal apothecary models the only source for apothecary backpacks and Nartheciums? I may be odd but I prefer the plastic models but buying the whole command squad for the Apoth. seems awfully wasteful. Then again I always need more bits now don't I? Basically some Death Company parts, mixed with apothocary parts from the command squad kit. *boom* you've got yerself a Sang Priest. @Ron- are you being sarcastic/funny when you say stuff like, "With the Codex apparently making these guys valuable, more and more are finding their way into Blood Angel lists." and " I guess these guys are that good in a Blood Angels list that having three of them makes the difference."? uhhh...you HAVE read the Codex, and know what these guys DO, right? Yeah, safe to say, if you put 40k models on a game table since the book has hit, you've been seeing these guys A LOT already, and the vast majority of BA players run these guys. So I'm gonna figure yer cracking jokes. 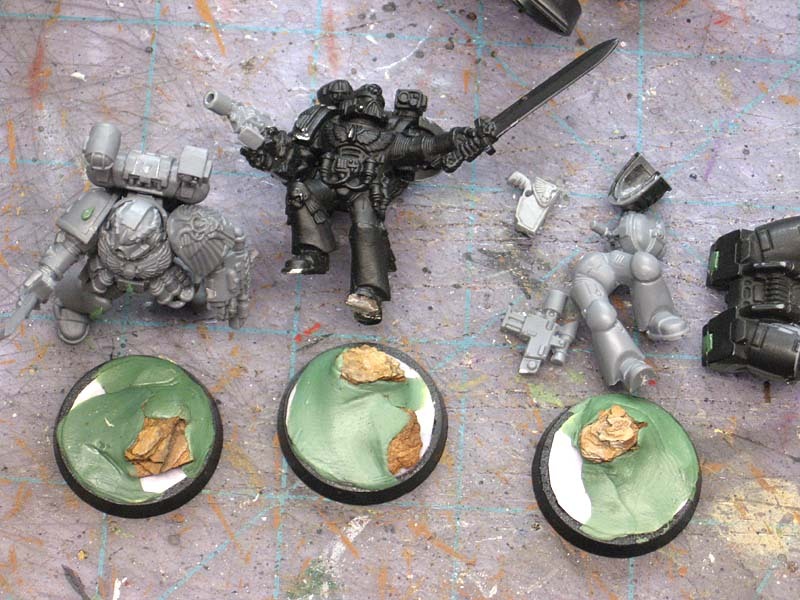 Anon: Changing the color of a purity seal can have a huge impact on the look of a model overall. I just figured the red on red wouldn't do much to bring it to like , so I went with a blue/purple look to them. Dan: I too prefer using plastic, but I think (and someone who knows better may correct me) that they come in the Command Squad box set and the metal model (but that is already partially assembled). You can oder just the bits you need online though and that's what I do most of the time. SinSynn: I am joking... but I have not read the BA codex nor do I know exactly what they do for a squad. I do know that when someone asks for three of them for one army, they are either building a very specific theme or these guys play a substantial role and have some nice benefits to fielding them. The only Apothecary I know of is the Deathwing one and what he does on the table. I spent a lot of time and effort developing a nice dark red recipe. Thanks for the link, I added it into the post.